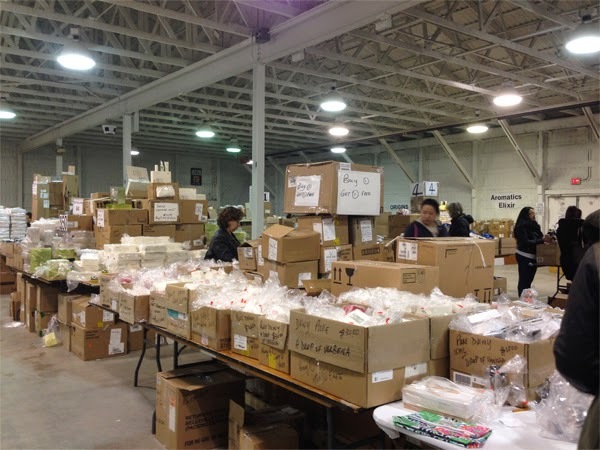 Canadian Fascination: Estée Lauder Warehouse Sale Spring 2014! 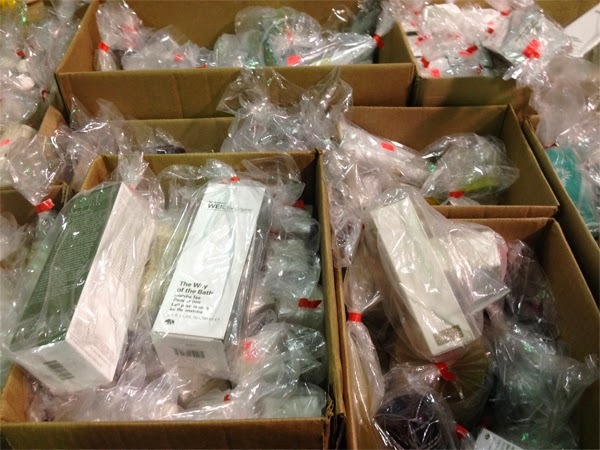 Estée Lauder Warehouse Sale Spring 2014! 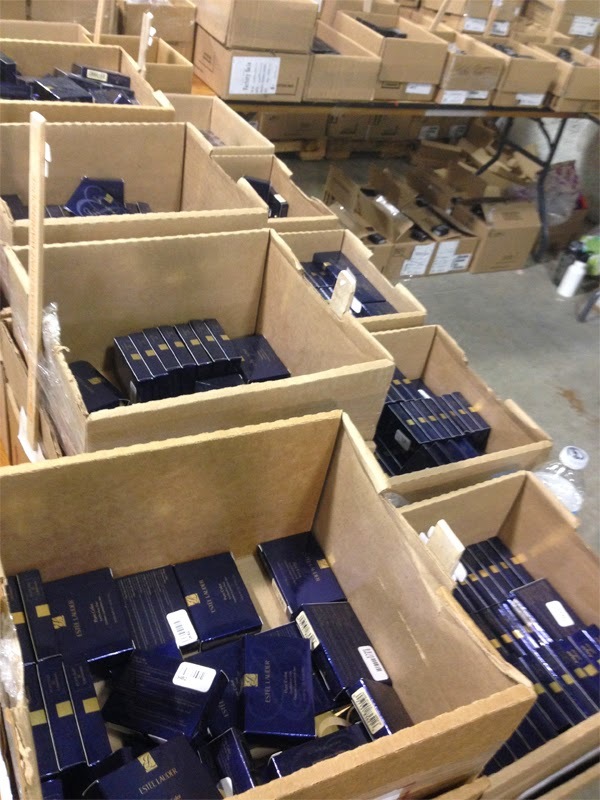 I am always super excited when I get tickets to the Estée Lauder Warehouse sale. A friend of a friend is a makeup artist for MAC and gets us tickets. We have always gotten tickets for the Saturday of the sale and have gone super early in the morning. We have heard that Fridays are the best day because all of the new, best stuff is put out. This time we finally got tickets to go on a Friday and experience the madness! Friday's are crazy at this sale. I thought you guys would like to see inside the warehouse sale so I took a bunch of pics! 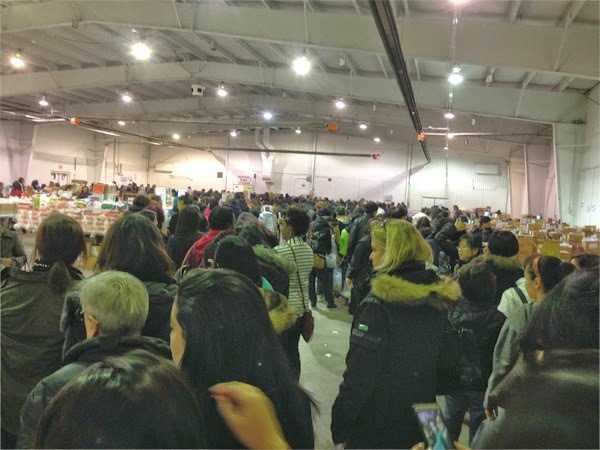 The sale is held at the Markham Fairgrounds and takes place in three large connecting rooms/buildings. It isn't the classiest looking set up, but it works. There are tables all around the edge of the room and in the middle. They have boxes full of product in them. Usually it is skincare items, perfume sets and makeup bags. These items are individually sealed in plastic bags so that you can't open them. No opened packages will be accepted at the purchase line. 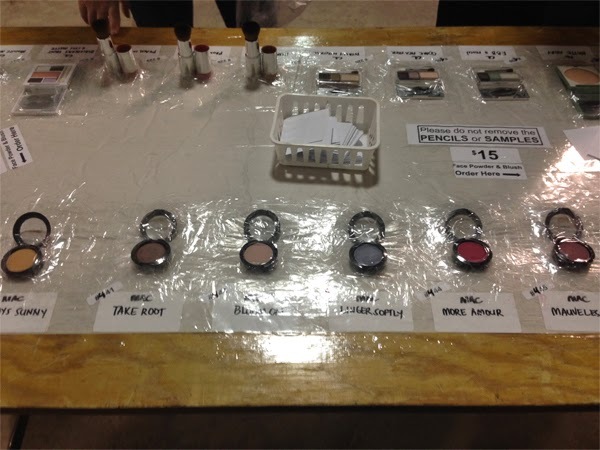 All of the actual makeup, excluding palettes, are set up on tables. On these tables makeup items are taped down. At most of the tables you can swatch and touch the items. They have the name of the product underneath them which I find very helpful. They also have a small number in the top left corner. Each table has a price posted on it, or on the wall above it, and a stack of small white pieces of paper. You write down the numbers of the products that you want and take them to a seperate table. There are boxes of open products behind the table. You give your sheet to the girl at the table and they will put all of your stuff in a bag, seal it and write the price on the bag in permanent marker. Perfume is the most prevalent item at the sale. There are a TON of Coach, Clinique, DKNY and Estée Lauder perfume sets, presumably from Christmas time. There are also a decent amount of Bumble and Bumble hair products and lots of skincare from MAC, Estée Lauder, Origins and Clinique. Makeup-wise, they have tables with blush, eyeshadow, mascara, foundations, concealers, nail polish and lipstick/lipgloss from Mac, Estée Lauder, Clinique and a few Bobbi Brown and Smashbox items. Friday was definitely better because there were a lot more Smashbox and Bobbi Brown makeup items. If I didn't already own 800 neutral eyeshadow palettes I would have picked up a few more. They had a great selection at a great price. The only downfall to Fridays were the ridiculous line ups! The picture above shows the line up that went all the way through the third room/building to the very end. This isn't just a hoard of people, it was the line up to pay! Insanity. If you hate lines, do not come on Fridays. I have never seen a lineup like this before on a Saturday. 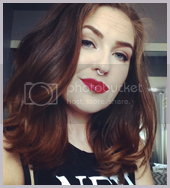 I didn't go crazy, but I also own a ridiculous amount of makeup. And I knew I was going to the L'Oreal sale immediately afterwards (yes, two warehouse sales in one day, I'm nuts!). I did find a few great things though. I was able to pick up the Mac Mineralized Skinfinish in Lightscapade which I was super stoked about. I have heard amazing things about this MSF and had contemplated buying it and I got it for only $15! I picked up the gorgeous Smashbox trio in Electro. There is also a section in the final building with samples for only $4.00. That is where I picked up the Bumble and Bumble colour minded shampoo, the Clinique Repairwear eye cream, the Clinique All About Eyes Serum and the Origins Drink Up lip balm. When you leave there is a spot where you can donate $5 to Mac AIDS foundation and you get a grab bag. 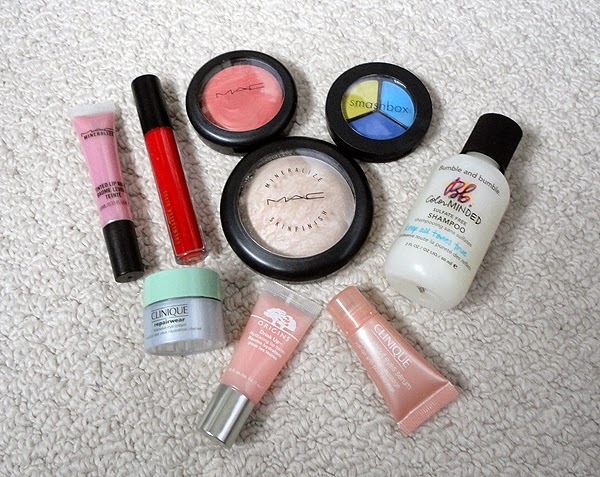 In this grab bag I got Mac Mineralize Lip Balm in Sweet Tooth, Mac Creamsheen lipglass in Prepare for Pleasure and the Mac Extra Dimension Blush in Autoerotique. You don't get to choose what you get but the proceeds go to a great cause and generally you end up with more than your moneys worth. I always come home with less and less, but that may be because I somehow keep owning more and more makeup! I always have a great time at the sale and say if you can get your hands on a ticket, do it. Estée Lauder gives them to employees so if any of your friends work for Estée, ask! There are great deals and a lot of madness but it's worth it!